Primrose Cottage01692 650667work Self-cateringThe accommodation comprises of a kitchen diner living area with a sofa bed, TV with digital box and DVD player. The kitchen has a full cooker, microwave oven and fridge freezer along with all crockery and cooking utensils. 1 double bedroom and 1 twin room in which the beds can be linked together to make a king size bed. All bed linen is included in the price along with a bath and hand towel for each guest. There is a large wet room with spacious walk in shower with seat, low level sink and toilet and grab rails. The bungalow is double glazed and centrally heated. The accommodation comprises of a kitchen diner living area with a sofa bed, TV with digital box and DVD player. The kitchen has a full cooker, microwave oven and fridge freezer along with all crockery and cooking utensils. 1 double bedroom and 1 twin room in which the beds can be linked together to make a king size bed. All bed linen is included in the price along with a bath and hand towel for each guest. There is a large wet room with spacious walk in shower with seat, low level sink and toilet and grab rails. 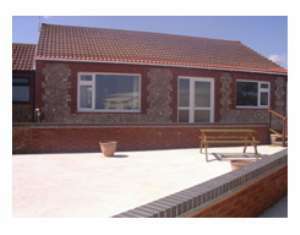 The bungalow is double glazed and centrally heated. Primrose Cottage is situated on Cable Gap Holiday Park a friendly quiet park at which the owners take a major part in the day to day running of. We also have 22 caravans to hire all centrally heated and double glazed and to a high standard all of which have Rose Awards. Primrose Cottage is open from 15th February 2010 until 3rd January 2011. Prices start from £348 in low season and up to £578 in high season. Special offers and short breaks are available. From Norwich follow the B1150 to North Walsham, then follow signs to Edingthorpe, you are then on the Bacton Road, on reaching Bacton turn left onto the B1159 towards Cromer. From Cromer, following the B1159 we can be found on the left, between the Coast Road and the Sea.